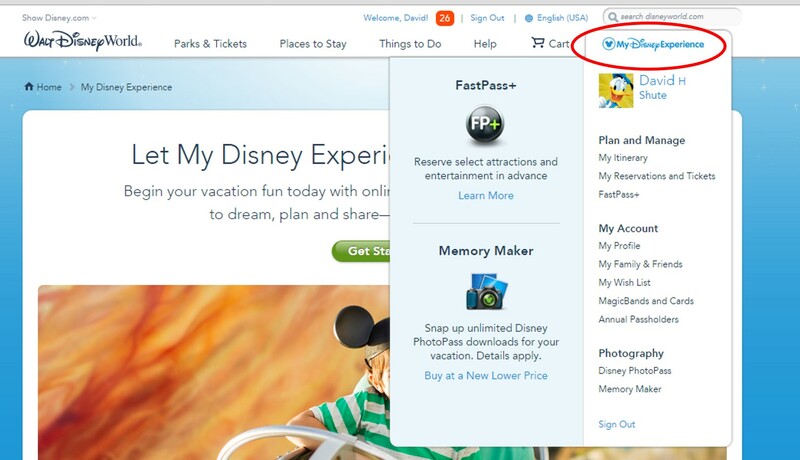 The My Disney Experience web resources (and app) is a key tool for planning your Disney World vacation–especially FastPass+. 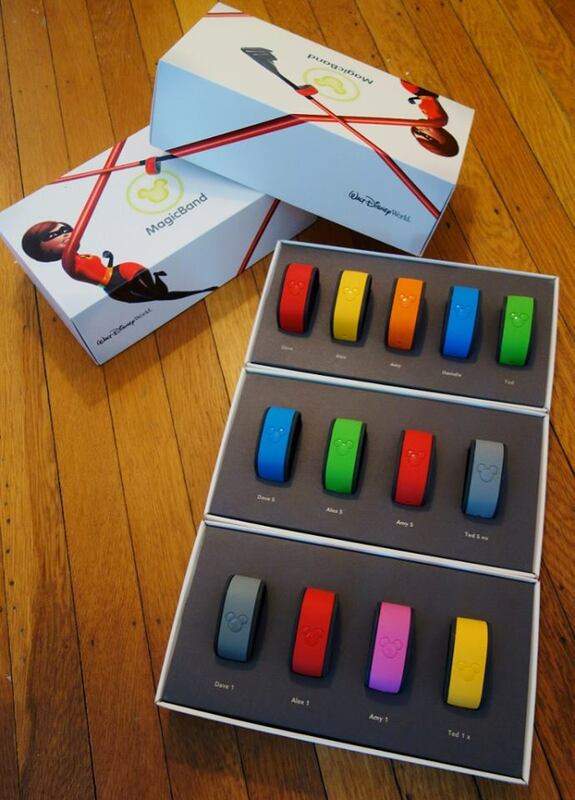 And if you are staying in a Disney-owned resort, you need to know about MagicBands too! If you don’t already have a My Disney Experience (MDE) account, sign up for one by visiting this page and clicking the “sign in or create account” button in the middle of the screen. There’s also a My Disney Experience app. Once you are signed up on the website, get the app as well. Although Disney does not make a big deal out of this, the website is meant for planning, and the app for in-Orlando checks and changes. It is generally easier and faster to do your planning via the website. 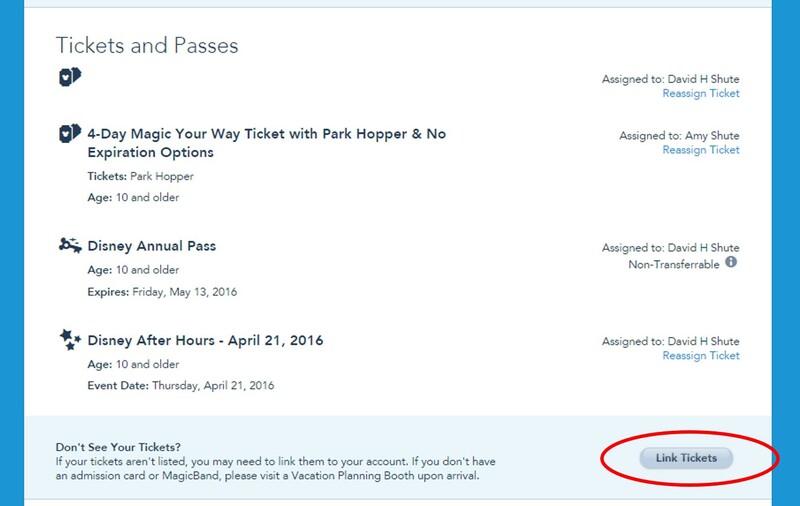 A My Disney Experience account is required to make FastPass+ reservations, and handy for all your other reservations. If you are staying at a Disney-owned resort hotel, you also use it to customize your MagicBands (more on those below) and do online check-in. See the menu items at the top of the image. From your account you can buy tickets (“Parks & Tickets”), book your hotel (“Places to Stay”), make dining and other reservations (“Things to Do”), and see your current plans. 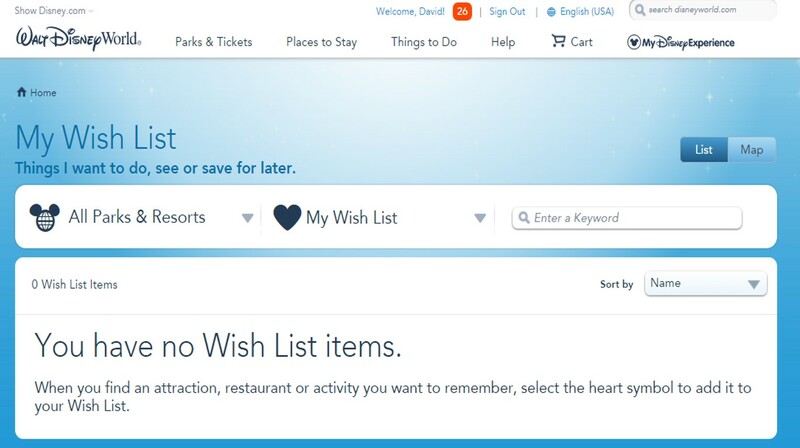 There’s many more tools in the “My Disney Experience” dropdown at the right. “My Itinerary” will show everything MDE knows about your trip, one day at a time. 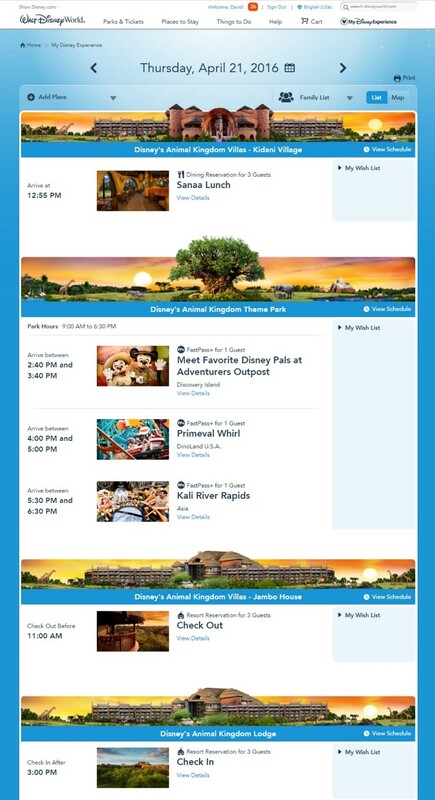 So it knows and reminds me that April I am having lunch at Sanaa, later have some FastPass+ at the Animal Kingdom, and am checking out of a Jambo DVC room and into a regular Animal Kingdom Lodge room. It also adds a list of your valid tickets, and begins with, in red, some annoying messaging. Messaging is one of the weaker parts of the MDE site—there’s no way to mark messages as read, etc. One important feature of this “My Reservations and Tickets” page is that you can link tickets and reservations that you did not make from your MDE account, like if you bought discounted tickets from the Official Ticket Center, (or that just aren’t showing up there) by clicking the “Link Tickets” or “Link Dining Reservations” buttons. You need your reservation numbers to make these work. “FastPass+” is where you make and modify your FastPass+. 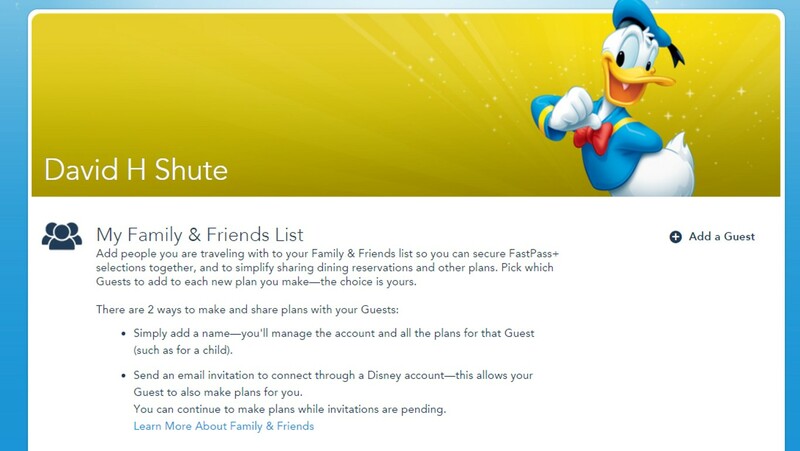 Details on how to set up your Disney World FastPass+ are elsewhere on this site. “My Profile” is where you edit, review and change your basic data. Adding other folk lets you then assign tickets to them, group them into FastPass+ parties you are scheduling, add them to dining reservations, etc. The simplest way to do this is just to type in their name. Disney has instructions for more complicated relationships here. If you have trouble, try tech support—at (407) 939-5277—and have the ticket and reservation numbers of the missing elements at hand. Next is “My Wish List.” I’ve never used it nor do I know anyone who has, but it’s meant as a place to bookmark things you want to do. The most important thing you do here is to de-activate old MagicBands, as having more than around ten active at once messes with Disney’s systems especially at the hotels, as I have learned the hard way. More on MagicBands is below. 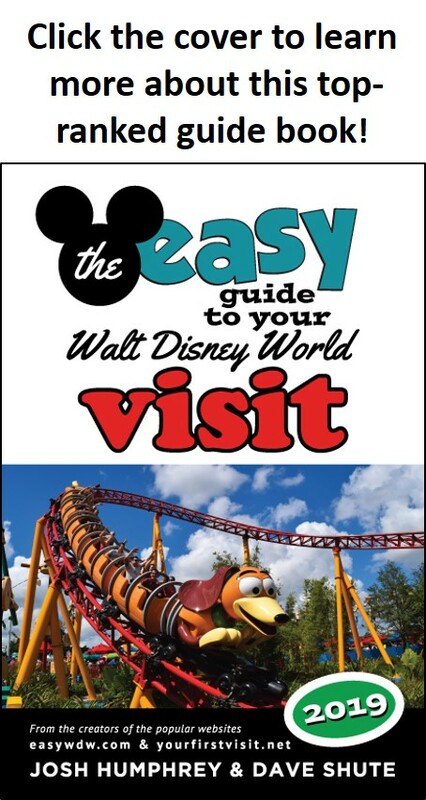 The last link in this section is for annual passholders. For those staying at a Disney-owned resort, MagicBands are quite handy, and play many roles on a trip. For those not staying at a Disney-owned resort, they do little, are entirely optional, and should really be thought of as souvenirs. 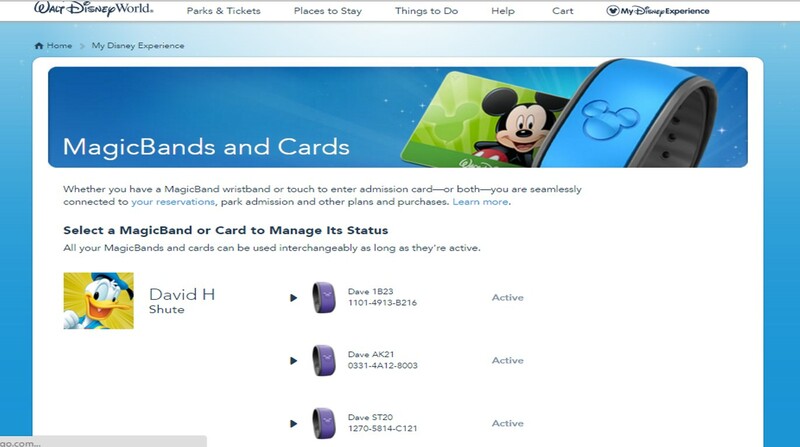 For Disney-owned hotel guests, MagicBands link to everything Disney knows about your trip, and in particular to all of your reservations—hotel, dining, and FastPass+ in particular. They then function as room keys, park tickets, the link to using your Dining Plan credits, the link to FastPass+, and, if charging privileges are enabled (which you can do or not do for each person on your reservation), a means to charge back to the room. They contain no personal data—rather, all they have encoded within them is a unique numeric identifier which Disney uses to link up databases in its own systems behind the scenes. MagicBands are waterproof—you can wear them in the pools or the waterparks. Although designed as wristbands, they don’t even need to be worn on a wrist—you can stick them in a pocket or purse and just wave them about when needed. Many need to take them off and wave them about anyway since not all the readers work easily when they are on a wrist, especially on hotel room locks. 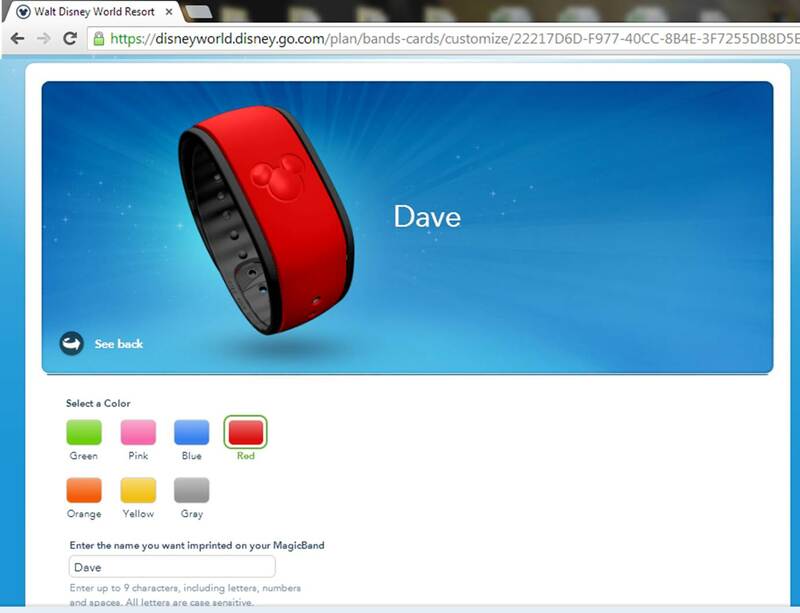 The color and names printed on the MagicBands can be customized online at DisneyWorld.com after booking. 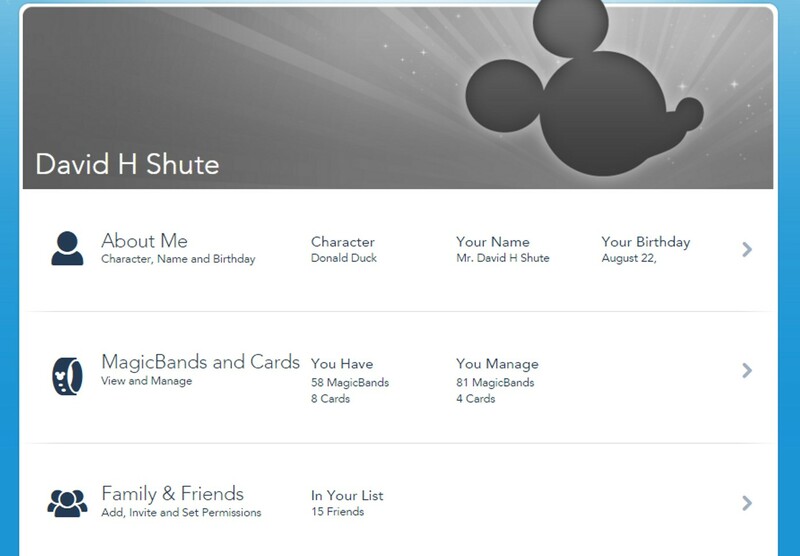 To customize your MagicBands, select MagicBands and Cards from the My Disney Experience dropdown menu. 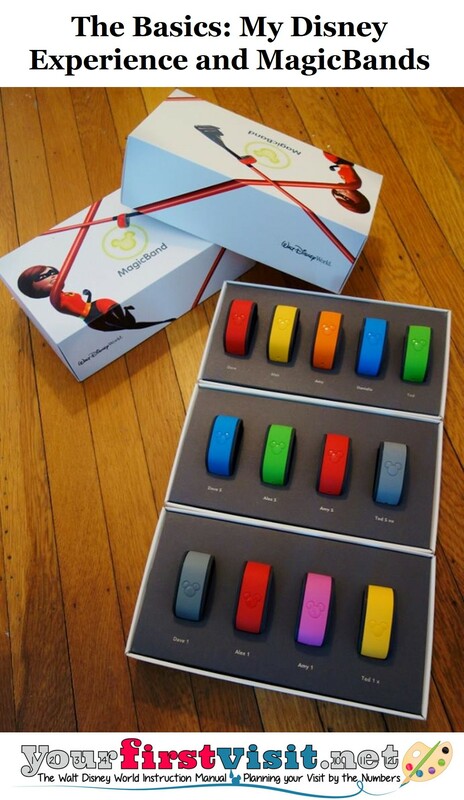 Confirm the shipping address, then select MagicBands one by one for the people in your party. 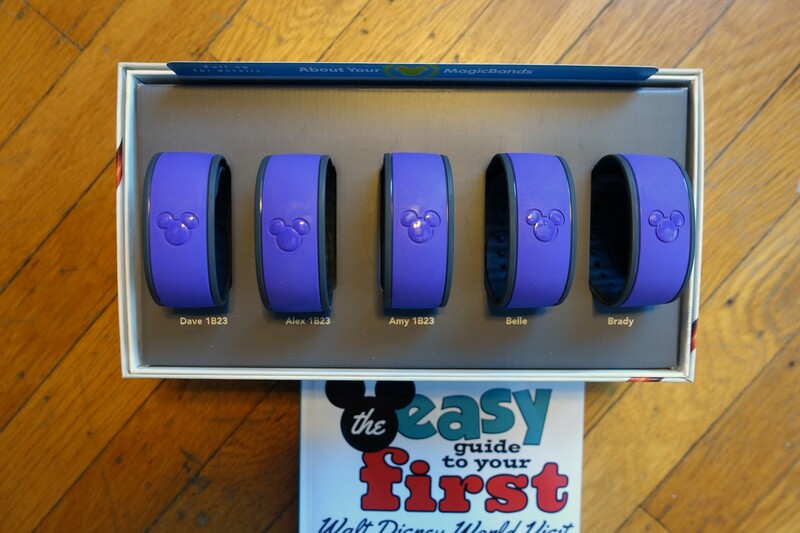 For each MagicBand, pick a color and customize the name, which is limited to nine characters including spaces. So “yourfirstvisit.net” does not fit. The initial set of colors included red, orange, blue, green, pink, yellow and the default grey. The latest color to be added is purple. If you already have recently-created MagicBands, you can decline new ones. I haven’t so far, as perhaps you can tell. I have a quaint notion that those who write about Disney World hotels ought to have recently stayed in them, and my stack of MagicBands provides a little evidence that I‘ve done so. So do my reviews. MagicBands will be shipped directly to the U.S. address of your choice if they’re customized at least 10 days before the arrival date. MagicBands customized closer to the check-in date will be available at check-in at the resort. Disney does not ship MagicBands internationally,which means all visitors without a U.S. address will pick up their MagicBands at check-in. If you fail to customize the MagicBands at all, grey MagicBands will be waiting at the resort at check-in. 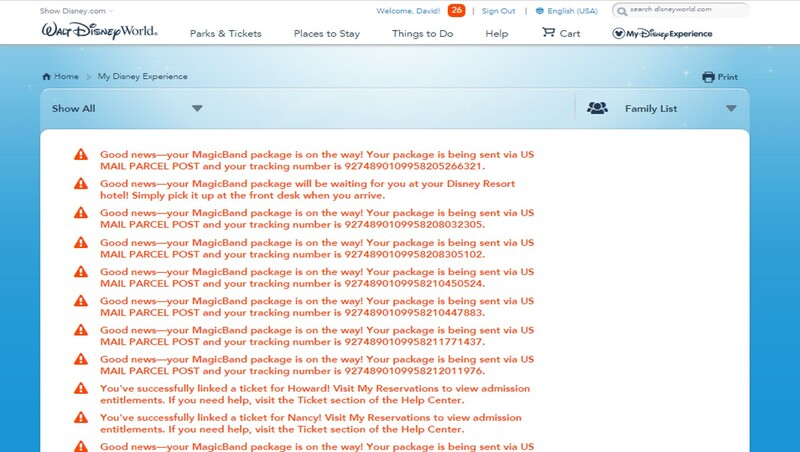 Those not staying at a Disney-owned resort can purchase MagicBands on site. 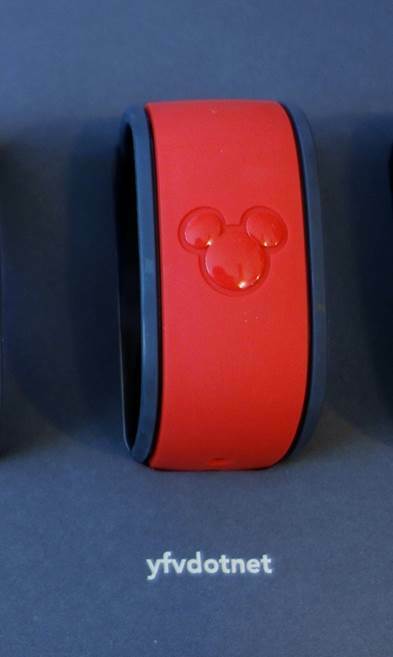 The MagicBands of such visitors are linked at the time of purchase to their theme park ticket, and the MagicBand can then be used for FastPass+. Note that a MagicBand is not required to use FastPass+ (a ticket, of course, is required) and off-site guests can simply scan their ticket instead of a Band. Hi Dave! I absolutely love your site! Thank you for providing so much detailed information. My family and I stayed on site in November of 2016 and have kept our MagicBands. If we stay at an off-site hotel for a trip next year can I link our park tickets to our old MagicBands and use them for park entry and FP+? Is an off-site park ticket paper or like a plastic card? What if your paper ticket gets lost or damaged? Thank you! Thanks Dave! This is very helpful! Gathering information, deep-diving into details, scrolling through pictures of various hotel rooms and rope drops…This is my favourite leisure-time activity lately! I don’t suppose there’s a group for those who tumble too far down the rabbit hole. 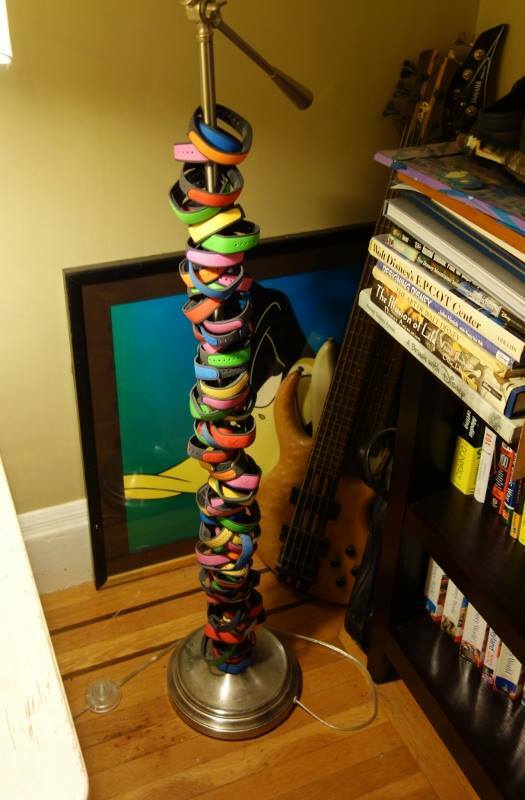 I have a question about Magic Bands. We are planning a 14-day stay, split between 2 hotels on-site. The first is at AOA with 10-day tickets. The second is at the Treehouses and is room-only. We also plan to upgrade our tickets to APs when we arrive. 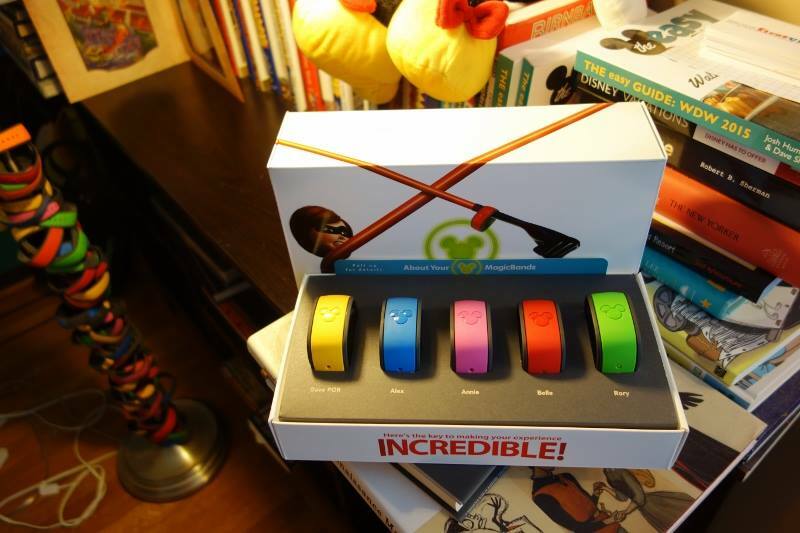 I know we will get MagicBands for staying on-site with the first reservation, and I can see those in MDE. Will we also get MBs for upgrading to APs? If so, are those limited to the same solid colors as on-site guests? Will those be mailed to our home, or can we get those while at the park? Since we have 2 hotel reservations, will we also get MBs for the second hotel stay? I asked this in a Facebook group and got all sorts of conflicting answers. I would LOVE to have a collection of MBs to rival yours. I would love to visit WDW enough times to collect that many. Ann, you can request a separate Magic Band set for each reservation. You can also request MBs for each annual pass. I seem to recollect that the AP option takes a while to show up on MDE–that is, it is not instant. I believe the color set for AP band is the same as for room bands. 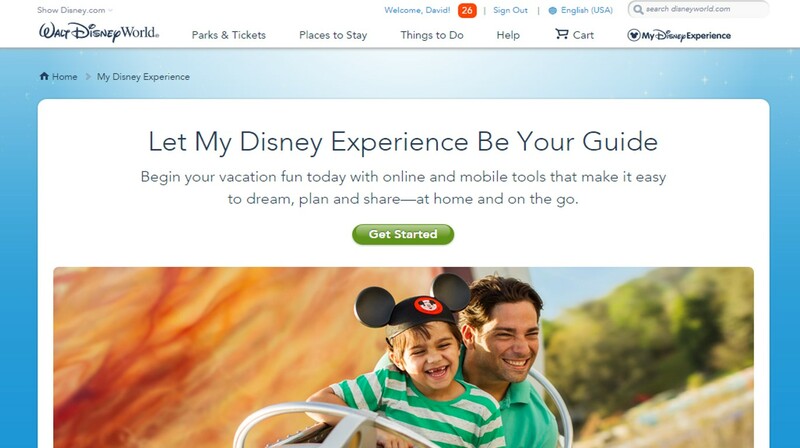 Hi Dave, I want to make sure I set this up right – I have an account I use to shop on Disney do I use this account or set up a new one for our trip? We are staying off site and have already purchased tickets, do I set up my account and add my family and link our tickets to each family member myself or do I have each person set up an account and link to them that way?